Claude Garelik: Serving the State for 21 years! By in Uncategorised on 5th April 2016 . On April 22, 2016 Claude Garelik will be retiring from the South Dakota Board of Regents after serving the higher education community for 21 years! Claude began his journey working in South Dakota in October of 1995 when he joined the University of South Dakota (USD) to become the manager of Networking Services. A native of Newark, New Jersey, he was recruited from the east coast to attend Yankton College. He graduated from Yankton College in 1968 after enduring many 44 hour train rides back ‘n forth to NJ. After working for many different companies he returned to South Dakota for his graduate study and working at USD in 1995. In 2001, he took on a new System-wide role as the Director of I/T Security for the South Dakota Board of Regents (SDBOR). Eventually this position transitioned to the Chief I/T Security and Networking Officer. 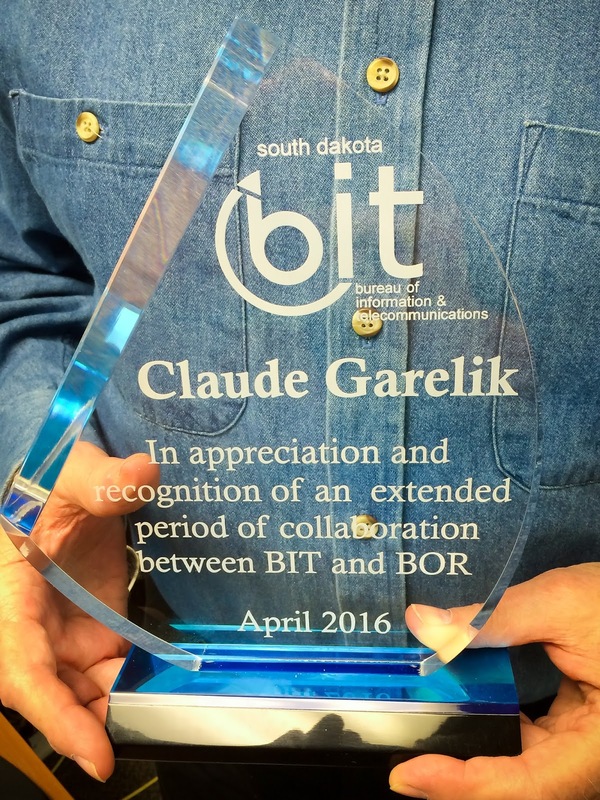 During his tenure with the SDBOR, Claude has served as a valued partner with BIT on many projects and initiatives. In his most recent position, Claude was responsible for overseeing network planning, implementation and I/T security for all of the SDBOR public universities. These duties led to Claude working closely with BIT staff for wide-area networking, security, compliance, and advanced technology efforts. Claude was a key member of the task force that led to the construction of South Dakota’s Research, Education and Economic Development network, commonly known as REED. Claude was instrumental in bolstering South Dakota’s position in the Research and Education network communities with his work with Internet2 and the Great Plains Network. The relationship between BIT and the Board of Regents can be challenging considering varying political, financial and technology considerations. Claude has always been successful to bridge those gaps without losing sight of the end-goal. Currently, Claude serves as the chair of the Great Plains Network (GPN) Executive Council, specifically holding a place on the Network Program Committee (NPC), which aims to provide networking services to members that wish to participate. He also serves as a committee member for EPSCoR and the Sanford Underground Research Facility. Claude has also served as a former chair for the Quilt, a national coalition of advanced regional networks for research and education. 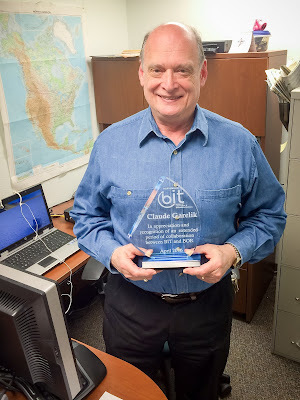 Whether Claude was serving as the principal investigator (PI) or co-PI on National Science Foundation research grants, securing our public higher education institutions through rigorous security assessment and compliance checks, or collaborating on the latest telecommunications and network technology project, Claude has always put the students and faculty from South Dakota first and foremost. His coming days will be filled with travel around the world with his wife by his side. Best of luck in your travels and best wishes for a healthy retirement, Claude! You have left a legacy of networking and security footprints that will be remembered far into the future.